The Zionist Organization of America (ZOA) was the subject of FBI/Justice Department investigations in 1948, 1954 and 1970 to determine whether its activities required registration as an agent for Israel under the 1938 Foreign Agent Registration Act (FARA). On February 25, 1948 the US Department of Justice (DOJ) asked the ZOA to begin registering and to disclose funding flows and relationships with the World Zionist Organization. Although the ZOA initially agreed to register, it later promised to orchestrate a change in not only its own corporate organizing documents—but the constitution of the World Zionist Organization—in order to avoid regulation under the Act. However FBI and DOJ interest in the ZOA continued, spurred by news reports and citizen complaints. The ZOA's early refusal to comply with FARA may have served as an example for other Israel lobbyists and organizations. In 1951, AIPAC founder Isaiah L. Kenen ignored a DOJ order to continue registering after he left his job under the Israeli Ministry of Foreign Affairs. In 1962 the AZC (of which ZOA was a constituent organization) reconstituted by incorporating its lobbying group, the American Israel Public Affairs Committee (AIPAC), six weeks after a FARA order. In 1971 the Jewish Agency's American Section reconstituted itself after public revelations of its direct control by the Israeli government via a secret Covenant Agreement. On 9/21/1971 the Jewish Agency simply re-registered as another foreign agent, the "World Zionist Organization - American Section" claiming no Israeli government ties—and placing itself alongside the ZOA under the WZO. This reveals the "Rubik's Cube" properties of major Israel lobbying organizations—which shift corporate shells and organizing documents in order to appear to meet statutory requirements event as US activities in coordination with the Israeli government continue unabated. The following archive traces FBI investigations of the ZOA from 1942. Also see the Justice Department foreign agent file on ZOA, which suggests that even by 1960 the promised reorganization to avoid FARA had not been implemented. ZOApt1.pdf 2.4 MB FBI news clippings from 5/14/1974, 10/21/1942; 9/20/1943 cable on ZOA Aliyah program, 11/18/1943 ZOA meeting summary "Dr. Holler, chairman of the Administrative Committee of the Zionist Organization of America, devoted the greater part of his address to a defense of the Zionist movement, and was particularly emphatic in denying charges brought against Zionists by representatives of the American Council for Judaism." 1/8/1948 memo about possible ZOA violations of the Neutrality Act and notification of the DOJ Criminal Division, "Ordinarily, we would initiate Neutrality Act inquiries without prior referral to and approval of the Criminal Division, but in view of the delicacy of the current Palestine situation, and of the concern recently expressed by the Director relative to certain of the Bureau activity in this general field, it is felt that prior to the initiation of investigation, we should put such matters...up to the Department for advice." 3/29/1948 FBI memo, The ZOA Milwaukee Branch, "has been holding various meetings in Milwaukee for the raising of funds for the assistance of the Jews colonizing Palestine. Similar meetings being held throughout the U.S. Members stated funds to be used for purchase of clothing, food and agricultural equipment and not for purchase of arms or ammunition." Undated FBI bulletin to the Washington Field Division, "Will ascertain if the ZOA is presently registered with the Attorney General pursuant to the terms of the Registration Act...Will also attempt to ascertain if the organization is registered with any department of the U.S. Government relative to the transmittal of funds for relief purposes to Palestine and as to whether any account of the funds and/or relief goods is made to this agency." ZOApt2.pdf 1.3 MB 5/5/1948 SAC NY to FBI director memo, "It does not appear that there is a direct connection between the Zionist Organization of American and the organizations concerning which investigations are being conducted." 5/28/1948 FBI Director memo to SAC NY, "Under date of May 12, 1948, Mr. T. Vincent Quinn, Criminal Division, Department of Justice, addressed a memorandum to this Bureau concerning the Zionist Organization of America in which he advised that no violation of any federal statute has been indicated by the investigation undertaken to date by our Milwaukee Office. Mr. Quinn stated that in view of this it would appear that no further investigation is warranted at this time." 12/29/1948 FBI memo, "the Bureau received through liaison channels from the Intelligence Division, Department of Army, a confidential memorandum requesting information concerning the four captioned Jewish Organizations [ZOA, Joint Distribution Committee, Materials for Palestine, Great Circle Air Freighters]" 3/14/1949 SAC San Francisco memo to the FBI Director, "...recently called to my attention the Public Relations News Letter...below indicating that the Economics Affairs Commission of the Zionist Organization of America....desires to transmit to the new Israeli nation's Department of industry certain up-to-date information concerning American industry..."
"Close examination of these statements plus investigation of ZOA activities, present and past, easily leads to the conclusion that the ZOA is the agent of a foreign state, acting in its interests, and as such should be registered with the Justice Department or under the legislation affecting lobbies in the United States." FBI memo concludes, "The Bureau desires to refer this matter to the Criminal Division of the Department of Justice for an opinion concerning the obligations of the ZOA to register as an agent of a foreign principal." ZOApt3.pdf 5.2 MB News clippings. ZOApt4.pdf 4.8 MB News clippings. ZOApt5.pdf 2.9 MB News clippings. 10/28/1949 FBI Director memo to Assistant Attorney General Alexander Campbell, "You will recall that from time to time this Bureau has furnished the Criminal Division with information that has come to our attention concerning the captioned organization...It would be appreciated if you would advise this Bureau whether the attached material contains any information which in your opinion indicates that the Zionist Organization of America or its officers are engaged in activities which may be in contravention of the Foreign Agents Registration Act or any other federal statutes." 11/30/1949 FBI Director memo to SAC NY, "On November 8, 1949, Mr. Campbell [AAG] advised that the conclusion had been reached that the activities of the subject [ZOA] and its officers are not in contravention of the Registration Act." The Department further concluded that the activities of the ZOA and its officers were not in contravention of the Foreign Agents Registration Act and stated that no specific investigation was being requested at that time. You will recall that Mr. Nathan B. Lenvin of the Department advised our Washington Field Office Agent in confidence that the ZOA brought about a minor change in its constitution so that it might state it was no longer the agent of a foreign principal. As noted above, the Department stated the ZOA materially changed its constitution and at the same time affected a change in the constitution of the World Zionist Organization. The Department has not advised the Bureau of the nature of the changes made in the constitution of these Zionist groups." Citizen letters to FBI about the ZOA. Memos about investigations to determine whether ZOA actions are directed by State of Israel. ZOApt6.pdf 2.7 MB April 1, 1954 SAC LA memo to FBI director about the ZOA and Registration Act, "It will be noted that some of the information included in the insert reflects that I.L. Kenen [Archive] was an official of the Israeli Office of Information [Archive] at New York City, while other information set forth in the insert show the he was an employee of the American Zionist Council [Archive] in Washington, DC....it is unknown whether Kenen terminated his position....or whether he retains both positions at the present time." FBI file on reorganization and interrelationships of the Jewish Agency, World Zionist Executive, Israeli government and the ZOA. May 3, 1954 Memo to FBI Director from LA SAC that evidence of ZOA activities could not be publicly divulged since it would burn sources and methods. "Inasmuch as the information contained herein does not show such control or direction and insamuch as the information could never be divulged in any legal action in view of the delicate source of this material, it is suggest that the Bureau may not wish to disseminate the report..."
ZOApt7.pdf 4.7 MB News clippings and citizen letters about ZOA activities. 2/26/1969 letter from J. Walter Yeagley to FBI director authorizing interviews over ZOA ads in the Washington Post against Soviet peace initiatives in the Middle East. "This Division would like to receive any information that you might have available on the subject. In addition, this Division would appreciate any information that can be developed as to the subjects activities within the United States and whether the subject is receiving funds from any foreign principal, including the Government of Israel." ZOApt8.pdf 3.5 MB FBI-DOJ correspondence on previous FARA investigations, 11/20/1969 investigation of materials claiming Dr. Henry Kissinger pledged $20,000 to the ZOA, news clipping, "Zionist Pledge is Forgery, Kissinger Says," FD-302 interview with a ZOA executive, promise to send organizational constitution and bylaws for DOJ review. 10/2/1970 memo from J. Walter Yeagley memo to FBI director, "We have no further requests of your Bureau at this time with respect to the ZOA." 1/21/1976 ZOA letter to FBI Director Clarence M. Kelly congratulating him on statements against terrorism and requesting reprint rights for 3,500 copies Kelly's "Terrorism - The Ultimate Evil." Archive In 1971 the Jewish Agency's American Section reconstitutes itself after public revelations of its direct control by the Israeli government via a Covenant Agreement. On 9/21/1971 the Jewish Agency re-registers as another foreign agent, the "World Zionist Organization - American Section" claiming no Israeli government ties. The Justice Department deems the reconstitution as "sketchy." 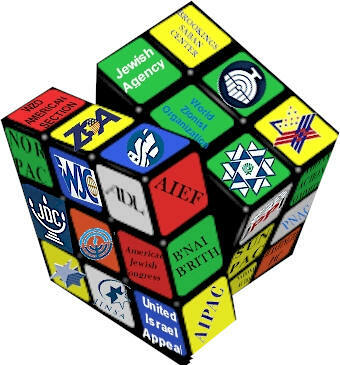 The Jewish Agency's reconstitution into a subsidiary of the WZO, an offshore organization under enough ZOA control for ZOA to effect constitutional changes in 1948, reveals the "Rubik's cube" nature of major Israel lobbying organizations. Paper transactions and shifting corporate shells are effected to avoid US Department of Justice FARA regulation while the activities and control relationships continue unabated.